In a globalised world HR professionals face many challenges around the areas of leadership and people management, cross-cultural and expatriate management, global integration, governance systems and, and reward and performance management. In increasingly globalised and dynamic work places organisations require adaptable professionals who understand these issues. Why study MA International Human Resource Management with Integrated Placement (15 months/24 months) at Middlesex University? Grounded in the standards of the Chartered Institute of Personnel and Development, the world’s largest HR professional body, this course provides a unique insight in traditional and non-traditional sectors with a focus on subjects such as international reward management, globalisation and liberalisation of the national economies, and comparative employment relations. As well as acquiring knowledge on these key topics you will also develop the capabilities to utilise people related data, metrics, and use analytics for insight driven and informed practice to further the priorities of the organisation. The course, designed for both graduates and HR professionals, has a strong emphasis on understanding the links between theory and practice, taught by an experienced and research driven team you will also attend guest lectures from renowned HR professors, develop skills in metrics and analytics with practitioners, residential activities, and have the option of integrating a 6 month work placement into your learning. If you would like a more graduated approach to undertaking study there is also the extended 15 month version of the course. Middlesex University is a CIPD Approved Centre and successful completion of the programme leads to Associate Membership of the CIPD. The course meets standards of Chartered Institute of Personnel and Development (CIPD), the world’s largest HR professional body. As part of this course, you can do an optional three month or one year industry placement. Programmes with integral placements give you the opportunity to apply the skills you have learned throughout your studies in a practical environment. You will be earning a full time salary and will learn skills that can't be taught in a classroom at University. During the placement, you will be able to gain further insight into industrial practice that you can take forward into your individual project and into your future career. Although the placement is not guaranteed, the University maintains links with a wide network of organisations who offer placement opportunities. The University will also provide you with full support to help you secure a placement, from job application to the interview. In order to qualify for the placement period you must have passed all modules in the semesters preceding the placement. The placement will take place after the taught modules and before your final dissertation/applied project. 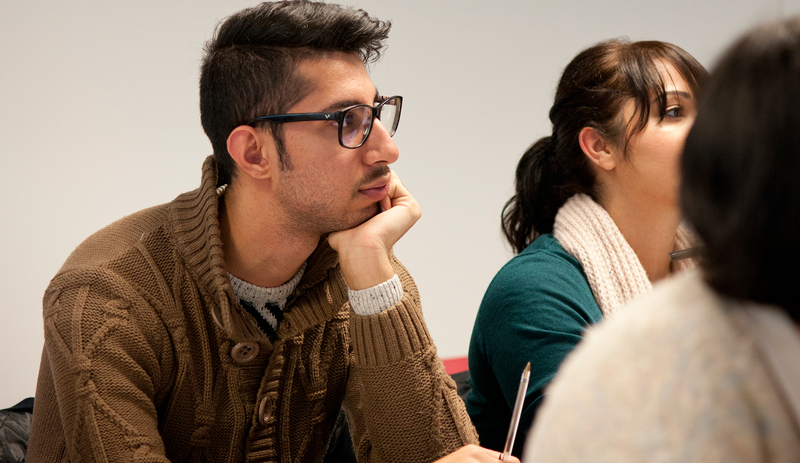 Sign up now to receive more information about studying at Middlesex University London. What will you study on the MA International Human Resource Management with Integrated Placement (15 months/24 months)? The core modules of the course constitute a common platform to lay the foundation for you to gain knowledge, think critically and apply theory to practice, required for professional excellence. Furthermore, the core modules impart in-depth insights on IHRM, data management and research. The four fifteen credit modules extend the knowledge and skills developed through the core modules and provide specific inputs on the key aspects of IHRM. Finally the dissertation provides an opportunity to do an independent piece of research and develop expertise on an area of your choice. This module aims the development of students’ professional practice and its application that are pivotal to successful people management and development practice. It develops a strong sense of self-awareness and of the students’ strengths and weaknesses as managers and as colleagues. The module enables students to critically analyse the concept of insight driven people management and development and its connection to the meaningful analysis of organisational data. The module provides student with the opportunity to develop ethical and sustainable measurement practices suitable for both challenging economic circumstances and organisational growth situations. This module provides insights on managing a diverse workforce through a critical reflection of both theory and practice of international human resource management. Cultural and institutional factors that influence IHRM are evaluated for their impact on practice. It reviews contemporary research on leadership, employment, and flexibility. This module provides students with an in-depth understanding of strategic reward management in a global context. It develops the skills to research and critically analyse reward within an international organisational context and to present written findings and recommendations to senior management. This module develops a critical appreciation of the theory and practice of organisation development. The course also develops a comprehensive and critical understanding of the key global changes and critically evaluates their influence in shaping and re-shaping organisations. The module introduces the field of Comparative Employment Relations to examine how institutions shape national employment relations. It evaluates the different models of capitalism and how systems of work and welfare differ in different parts of the world. The module also reviews the current debates surrounding corporate social responsibility and regulation, changes in production paradigms and international labour standards. The module examines how labour (both organised and non-organised) may develop an effective response to the challenges of globalisation. It evaluates different typologies of trade unionism in both the Global North and the Global South. Further, the recent re-emergence of social actors from non-traditional parts of the labour movement such as unemployed, migrant and cooperative-workers in response to both the intensification of globalisation processes, informality and social exclusion are considered. As part of this course, you will do either a three month or a one year industry placement. Programmes with integral placements give you the opportunity to apply the skills you have learned throughout your studies in a practical environment. You will be earning a full time salary and will learn skills that can't be taught in a classroom at University. During the placement, you will be able to gain further insight into industrial practice that you can take forward into your individual project and into your future career. In order to qualify for the placement period you must have passed all modules in the semesters preceding the placement. This module develops a student’s ability to identify and undertake a live empirical piece of research in the area of IHRM. This is achieved by developing the skills of a comprehensive review of the literature; collection and analysis of data, evaluation of their findings in the light of the literature, development of conclusions and making of practical and actionable recommendations. You can find more information about this course in the programme specification. Please note that optional modules may not run, due to student numbers or staff availability. If an optional module will not run, we will advise you after the module selection period when numbers are confirmed, or at the earliest time that the programme team make the decision not to run the module, and help you choose an alternative module. How is the MA International Human Resource Management with Integrated Placement (15 months/24 months) taught? The course will consist of a variety of different modes of assessment and feedback, which will include exams, individual coursework and group coursework. The coursework will involve a range of activities including portfolios, individual and group reports, management report and the dissertation project. UK/EU and international students are eligible to apply for this course. If you have relevant qualifications or work experience, academic credit may be awarded towards your Middlesex University programme of study. For further information please visit our Accreditation of Prior Learning page. Entry onto this course does not require an interview, portfolio or audition. To find out more about the qualifications we accept from your country please visit the relevant support in your country page. If you are unsure about the suitability of your qualifications or would like help with your application, please contact your nearest regional office for support. You will not need a visa to study in the UK if you are a citizen of the European Union, Iceland, Liechtenstein, Norway or Switzerland. If you are a national of any other country you may need a visa to study in the UK. Please see our visas and immigration page for further information. You must have competence in English language to study with us. The most commonly accepted evidence of English language ability is IELTS 6.5 (with minimum 6.0 in all components). We also normally require Grade C GCSE or an equivalent qualification. Visit our English language requirements page for a full list of accepted tests and qualifications. If you don't meet our minimum English language requirements, we offer an intensive pre-sessional English course. Applications for postgraduate study should be made directly to the university. Please visit our Postgraduate application page for further information and to apply. The fees below refer to the 2019/20 academic year unless stated otherwise. For more information and to answer your frequently asked questions, please visit our postgraduate funding page. How can the MA International Human Resource Management with Integrated Placement (15 months/24 months) support your career? The course aims to impart a unique mix of knowledge and skills, as well as developing robust analytical capabilities, for anyone wishing to progress in a HR career, whether that is with multi-national corporations or non-traditional organisations such as NGOs. Programmes with integral placements give you the opportunity to apply the skills you have learned throughout your studies in a practical environment. You will be earning a full time salary and will learn skills that can't be taught in a classroom at University. During the placement, you will be able to gain further insight into industrial practice that you can take forward into your individual project and into your future career.